Twisted Pixel's first Kinect title gets a solid release date along with a fair price point. Also - Free game! 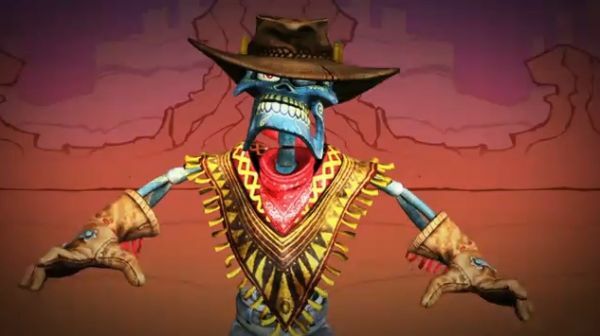 Twisted Pixel's upcoming Kinect on-rails shooter called The Gunstringer has gotten a release date. It'll be hitting the Xbox 360 on September 13th and retail for $39.99. As you know, the game was originally slated to be a downloadable title, but was revealed at E3 to be a full retail game. We worried a bit about whether there would be the content to support it, but were assured the move to retail allowed Twisted Pixel more time to create content. Players who purchase the game at release will get a free piece of downloadable content. Plus, as a special bonus to celebrate the release of "The Gunstringer," players can also download a free add-on pack for the game at launch called "The Wavy Tube Man Chronicles" which pits players against the time-traveling son of Wavy Tube Man, the first boss players battle in the game. In this add-on, Wavy Tube Man Jr. steals a time machine to prevent his father's death at the hands of "The Gunstringer," and it's up to players to battle classic western cowboys and futuristic warriors to save the world from destruction. Apparently puppets, sorry didn't mean to insult you Mr. Stringer....apparently marionettes are the giving kind of folks, because along with the $40 price tag and a free piece of DLC, you'll also get a code in the box for the full version of Fruit Ninja Kinect - which comes out later this summer. That's two local co-op games, one box, $40, September 13th. Page created in 0.2448 seconds.